From Sacramento: East on Highway 50 to Placerville. 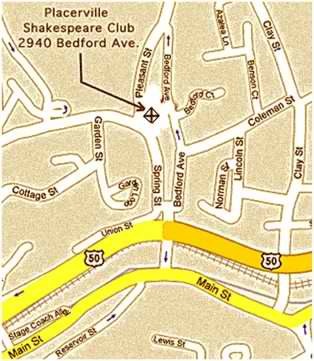 Turn left at 3rd stoplight onto Bedford Ave. Stay left at the immediate "Y" intersection (becomes Spring Street) to Placerville Shakespeare Clubhouse parking. From South Lake Tahoe: West on Highway 50 to Placerville. Turn right at 1st stoplight onto Bedford Ave. Stay left at the immediate "Y" intersection (becomes Spring Street) to clubhouse parking. Clubhouse parking lots are only accessible from Spring Street. The front entrance to the clubhouse is on Bedford Ave. where some on-street parking is available. To the Front Entrance: At the "Y" go right on Bedford (one-way street) to the clubhouse. Minimal on-street parking is available at this point. For parking lots, continue on to the stop sign (Pleasant Street), make a sharp left. Go to next stop sign, turn left on to Spring Street and park in either lot.